I don't know what you think, but for me this is a winning Mushroom family pie. Not only does it look excellent, it is deep and rich in flavour and texture. 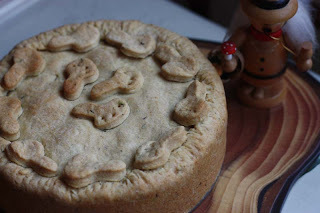 I know some people, will deem this deep mushroom pie as a pimped up nut roast, and perhaps it is. In its favour though, I know it will be graciously accepted not just by vegetarians and vegans, but also those who like their meat. Not only does this mushroom pie have the good looks and flavour, its not 'mush' or bland either. You can really taste all the flavours as well as the textures that have real bite. There is also a vegetarian haggis appeal about it - undoubtedly because of the oats. As a home cook, I am so indebted to the Vegetarian Society UK for including this recipe for 'hot water crust pastry' in one of its cookbooks. Upon discovering and mastering the basics of this pastry shell all those years ago, I have been able to fill it up with many vegetable variations such as Kale and chickpea pies, Sun dried tomato-basil cauliflower pies, Veggie 'not pork' pie, Spinach and Pasta Pie, Carrot and green beans pie, Spinach and feta pies and most recently Butternut Squash and chickpea pie. I've also had the opportunity to vary the pastry flavouring too with dried herbs, cumin seeds and chilli flakes. So proud I was of this Deep Mushroom Pie, a few weeks ago, I had decided to submit this and the Christmas Brussels Sprouts pie to this UK based vegetarian food competition. Its very unlike me to enter public competitions, but I was feeling very optimistic that day. Although I got an automatic electronic response for the submission, I did not get a human acknowledgement which was rather disappointing for me. Actually D was quite sceptic about me submitting the recipes in the first place. He said when major organisations are going a bit stale and profits are going down, they tend to look outside for fresh ideas, plus its a great way to get free promotion for the company brand. Some organisations then use the 'ideas' of others for their own ends, with very little reward to the creator . My attitude was different. For me it was about sharing and yes, it would have been a personal reward had it popped up on the site. However, I do know where D is coming from, we have both had people take credit for our work in the past. Anyway, rather than feel like I've lost out there, I thought I'd share it with all my lovely readers as I know in my little heart that this is a Winner of a Pie! Heat the oil in a large sauce pan and gently fry the onion until soft. Add the chopped mushrooms,and the whole mushrooms too, the thyme and cook until the juices begin to run. Remove from the heat and add all the other filling ingredients to form a thick but not dry, consistency adding a little water if necessary. Leave the lid on and allow to cool. Now prepare the hot water crust pastry. Melt the fat in the water and heat until about to boil. Add the liquid to the flour and stir with a wooden spoon until a dough is formed. Now you have to work very quickly, as the dough will get cold and be tough to work with. Divide the mixture into two-thirds and one-third. Roll out the two-third portion quickly and line the tin, pressing down so that it is snug to the tin and in its grooves and press well so it reaches almost top of the side of the cake tin. Then fill the tin with the cooled filling. Press the filling gently down with a spoon. Cut of excess dough around the tin, but not too much as you will need to pinch the lid and pie together. Roll out with the remaining dough and cut out a lid for the top of the pie filling. Place the lid over the filling, then gently press with a fork or pinch into the side of the pie so it seals. 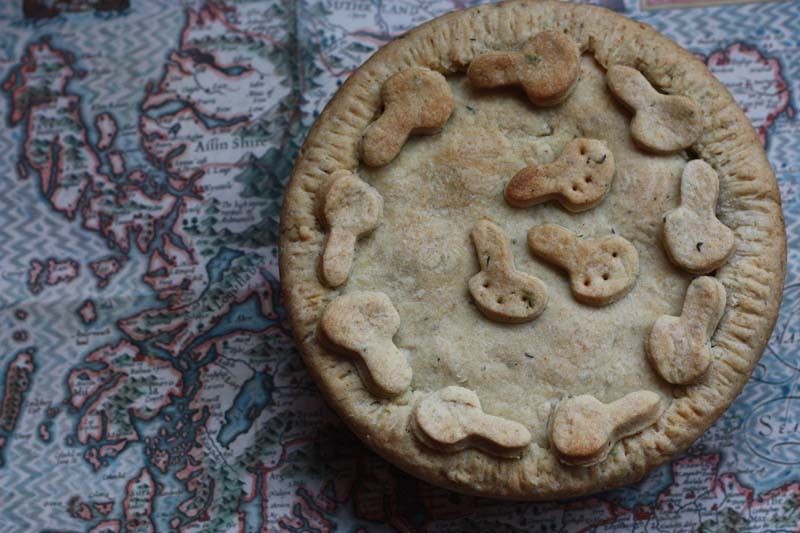 If you wish, with the excess dough, cut out decorative pie shapes such as mushroom and gently press onto the pie lid. Optional: Brush with oil and make a small steam hole in each pie. Bake in preheated oven Gas mark 6 for 45 to 1 hour till golden. Serve warm or cold. Inspired and adapted from The Complete Vegetarian Cookbook. That looks wonderful. Something my husband, eventhough he's a big meat eater, would like !! Wow Wow Wow! This is perfect looking! I lvoe mushrooms in everything, they are my favorite! I gave never made pies, and I am keen to try this. It looks healthy and delicious for me. i like the little mushroom shaped pastry you lay on top of the pie. You're really good at cutting beautifully shaped dough! I remember the chilli shortbread u made previously, I'm still wow by it. Wow!! Another winner for me to try. How many people do you feed on a daily basis? I'm backed up with great recipes from your site.Went to a pie tasting party and brought the pasta and spinach pie.It was well received but,we could have used a few more people to polish it off.Made a white cheese sauce when I was reheating the leftovers. This is the best pimped up nut roast I've ever seen , in my life;-) and that mushroom filling in yum yum yum! Thank you so much Monique Elisabeth. You have a wonderful weekend too. Thank you so much Morgan. I do remember the H&B and would now and again buy them for my lunch :) Please let me know how you get on with the pastry, it may take a few trys to perfect, but once your do you won't regret it. :) Write my own cook book?! Now that is a lovely suggestion. Thank you for your faith in me. You certainly must give these a try. Thank you so much Jean for your lovely comment. I wish I could claim the cutting of the shapes: mushroom and chilli pepper - but I use cookie cutters. I think the pattern on the pies, a bit like colourful cakes makes all the difference to how people look at them. It does certainly need something - I don't have Onion Marmalade. Do you? And would you like to do a swap for one of my home made chutney. I think being a chilli man, the Scotch Bonnet Apple chutney or Pumpkin chutney would appeal to you. Let me know via e mail. To be truthful this mushroom pie was made when I had some guests over, so it was shared with others. But normally its just the two of us and we do make the food last over a few days, sometimes taking it into work for lunch. I remember you mentioning you were taking a pie to a party. I am so plesed to read that the pasta and spinach pie was well received. I remember making the pasta pie and having to eat it for a few days. Its good warm and cold. I like the idea of the cheese sauce. If it make it again, I will certainly be doing that. Thank you again for your comment it is most appreciated. Really means a lot to me. I do hope you get to try the pies, I don't know what substitute you would have in Australia for the Trex - vegetable shortening though, but i am sure you will find a reasonable alternative. Thanks for sharing your thoughts on the competitions, it has some big celeb names behind it so will get good publicitiy. The way things have been for me recently and are sort of coming to an end, I was just looking for something positive to uplift my spirits (even if it was temporarily), hence the reason I thought I'd give it a go. But sadly not even a courtesy e mail to say no thank you. Thank you so, so much Patty. So glad you think this is the best pimped up nut roast you've ever seen ;-) It means a lot to me. Thank you so much Fer. So kind of you Sasha. Really appreciate your comment and you choosing to become a follower. Thank you so much. This looks amazing! You have decorated it beautifully and it looks jam-packed full of mushroom deliciousness. Thank you so much Hazel. Its was really 'jam-packed full of mushroom deliciousness' - a real delight if you were a mushroom fan. thanks, ive been looking for this recipe, my mum and sister make it for special occasions, ( dont know where they got the recipe) and i want to make it for them without asking them for the recipe... making it for special boxing day meal, wish me luck! Ive always loved it but the children have never had it, so i hope they will try! Wishing you luck, And a Merry Christmas.